Higher deduction. 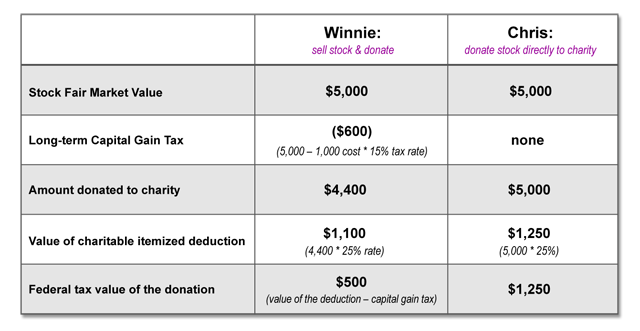 Your charitable gift deduction is the higher Fair Market Value of the appreciated stock on the date of your donation and not what you originally paid for it. No capital gains tax. You do not have to pay tax on the profits you made on the stock. As long as you have owned the investment for over one year, you can avoid paying long-term capital gain tax on the increased value of your stock. Not only does Christopher see $750 in additional federal tax benefit by donating his appreciated stock, but Honey Overeaters has $600 in additional funds to use for their charitable program. * Long-term capital gains tax rates on this type of investment can be as high as 23.8% for those in the 39.6% income tax bracket. The Alternative Minimum Tax (AMT) does not impact charitable deductions as it does with other deductions. Remember this approach also provides more funds to your selected charity. By donating cash or check, those additional funds are instead paid as federal taxes. This tax benefit could be worth even more in 2013 with the increase in the maximum long-term capital gain tax rate from 15% to 20% and the introduction of the potential 3.8% Medicare surtax for investments. This benefit is for everyone who itemizes deductions that have qualified assets, not just the wealthy. Remember this benefit only applies to qualified investments (typically stocks and mutual funds) held longer than one year. Consider this a replacement for contributions you would normally make to qualified organizations. Talk to your target charitable organization. They often have a preferred broker that can help receive the donation in a qualified manner. This benefit also works for mutual funds and other common investment types, but be careful as many investments such as collectibles, inventory and other property do not qualify. Contribution limits as a percent of Adjusted Gross Income may apply. Excess contributions can often be carried forward as deductions for up to five years. How you conduct the transaction is very important. It must be clear to the IRS that the investment was donated directly to the charitable organization. If you think this opportunity is right for you, please contact a trusted advisor to ensure you handle the donation correctly.